On Sale £367 - Plus VAT (No hidden extras). High quality, reliable units, specially designed for UK Dentists. 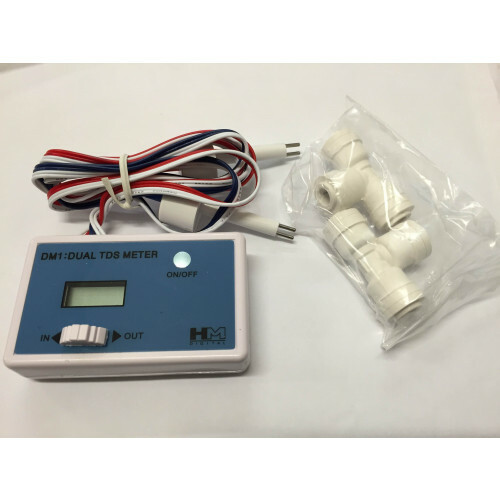 Includes a TDS meter to measure your water quality (Shows you In vs Out comparison to confirm filter is working). Dental Surgeries might use distillers to purify their water. However these are expensive and have various disadvantages. For example, they produce the purified water slowly - which can be frustrating. They can also use significant amounts of electricity. Or you might be getting ionised water delivered. This can be cheaper than a distiller but there's the hassle of stock control and deliveries plus the admin time in paying the regular invoices etc. Another method for purifying your water is Reverse Osmosis (RO). 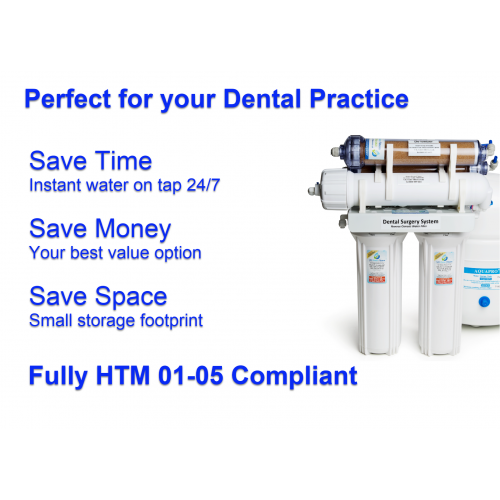 This is a highly efficient way of purifying water, on demand, which is becoming an increasingly popular solution for UK dentists. RO is a relatively quick, easy, one time installation. It filters your normal mains supply into medical grade water. A semi-permeable membrane separates water molecules from larger ions or pollutants. Our systems use the latest technology RO membranes for efficient performance and high yield production. They filter down to less than 0.1 microns. Plus it comes with a post-membrane demineralising cartridge and a TDS (Total Dissolved Solids) Meter. This measures the electrical conductivity / quality of both your incoming and filtered water and helps you monitor the state of the crucial membrane filter. The system relies solely on water pressure ie requires no electricity. The kit comes with a self tapping valve. No plumber is required. A normal handyman can fit the system easily - though some practices prefer to use a plumber. 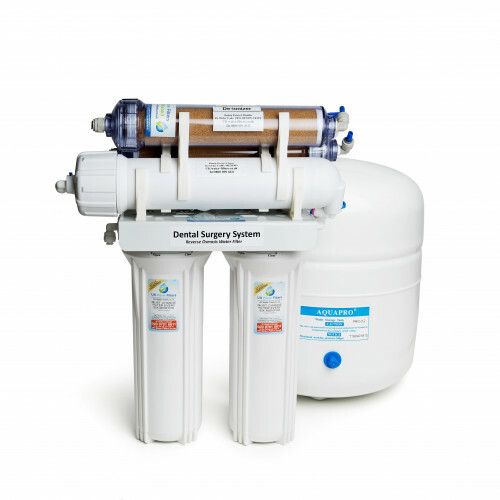 Many UK dental surgeries can end up paying many hundreds of pounds - or even more - for their water purification systems. It's important to note that Reverse Osmosis is a process. It doesn't have "degrees of performance" - it either works or it doesn't... So if you are paying a lot more for one RO system over another you need to ask why. We have seen some dental surgeries who have been sold very expensive water filters which are basically ROs with a fancy cover - and possibly extra filtration such as Ultra Violet (UV) - which frankly just isn't necessary. (Many dangerous contaminants, like bacteria, are taken out at the water treatment plants. However other contaminants get left in, which RO will remove). Despite what we said above about RO being a "process", cheaply made and/or deteriorating parts can lead to tiny leaks between the seals within the system. This risks contamination of the end-water. As part of the Reverse Osmosis filtering process about 60% to 70% of the incoming water is rejected. However please note that this is only lost from the water supply you are filtering - ie to your sterilising equipment and not all the water you use in the surgery. So the cost of this wasted water isn't as big an issue as it might seem. What's the Difference Between Reverse Osmosis And Distilled Water? Many dental surgeries use distilled water. Reverse Osmosis and water distillation are totally different processes. A distiller boils water, catches the steam, and condenses it back into water, while Reverse Osmosis filters water through a semi-porous membrane. 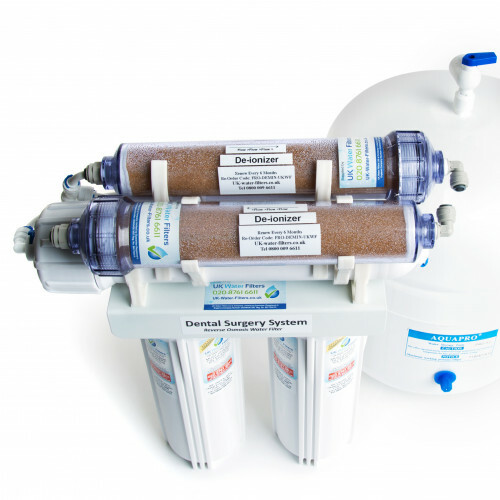 Both systems rely on carbon water filters to remove some chemicals. While Distillation removes sodium and other minerals better than Reverse Osmosis, they are not that good at removing volatile chemicals with a low boiling point. However both processes produce very pure water. The only real difference is in the economics. Reverse Osmosis tends to be much better value at least compared to the ongoing service contracts charged to Dental practices by distilled water producers. Otherwise it is all designed to be done by someone who's basically competent at DIY. Full instructions are included. It should take 20 or 30 minutes. As far as tools go, you will need a normal electric drill. That's all. You need to change four of the filters every 6 months. The current cost for the full replacement kit is is £47. (09:14:27) Hayley: We are looking at purchasing the Dental Surgery Reverse Osmosis, could you tell me how much water you feed in to how much sterilised water you get out? (09:26:54) UKWF Staff: Hello Hayley. Thank you for your question. As part of the Reverse Osmosis filtering process about 70% to 80% of the water is rejected. The Unit is NOT designed to filter HOT water. It should only filter water at ambient temperature. Storage Vessel Height 420mm Storage Vessel Diameter 280 mm Storage Vessel Capacity (max) 9 ltr. The unit should be fed by a "potable" water supply ie mains water. The unit is designed to operate between 40 psi (2.75 bar) to 80 psi (6 bar) (psi = pounds per square inch). Please note that the only problem you are likely to encounter with operating a Reverse Osmosis unit is if the water pressure is not high enough. The vast majority of UK properties have water pressure that is higher than the required 40 psi. The simplest thing to do is to turn your cold water tap on fully. Stand a few feet away. If you are being splashed with at least a few droplets then your pressure should be high enough. If this is not happening you should call your local water supplier. They should be able to tell you what your water pressure is and whether it is likely to drop below 40 psi at any time. We used to have a bigger RO system before. It was very expensive and a pain. It required a lot of pressure and was noisy. It was bought for the Washer Disinfector we were going to get in but with the change in HTM 01-05 we no longer needed it so decided to get this unit instead. This has been a big improvement. The only downside is that we sometimes need slightly more water than it produces in one run. But we manage fine by doing a load in the morning and then one in the afternoon. We could do with another one! We fitted this at beginning of May 2017. Very pleased, working very well... we log the water purity once a week and it's really good because we have got the TDS meter so you can see the difference between when the water comes in and when it comes out. The reading should be 10 or less and it always comes out around 3 which is really good. It's absolutely fine. Does the job. No issues at all. The water's always on tap and ready to go now - we used to use a distiller. It's good. We use it to feed our two large NSK autoclaves and the water for the instruments and units. It used to take us 8 hours to fill a bottle with the distiller. When it broke we got a 5 litre bottles of distilled water from the chemist. They were heavy and impractical. It's much easier just having the water on tap from this RO unit. The only effort it takes is changing the filters every 6 months and that hardly takes any time at all. We're very pleased. its fine and working well, we happy with it as it is easier for us now. before we used to have to fill the filters with water which took a long time. It's a lot better than using the distiller. We used to have to wait a full morning to fill up 5 litres ... now it just pours. It's never been a problem. It's good. We use it to feed the autoclave and all the water goes through it fine / it's never rejected. In fact we've recently bought another one for our other practice. We are very happy with the 2 units we bought. We've never had a problem with either of them. They are completely different and so much better than the old boiled water system we used to use. We don't have to wait around anymore. It saves us a lot of time. The reminders to change the filters are really useful. We are very happy to recommend these. We used to use a distiller in the decom room but it wasn't quick enough. This unit is far better. It fills a jug up in one go rather than having to wait around half the morning. And it's much more cost effective. Very happy with this. The CQC told us we should get one of these and you were recommended by Patersons when they did a refurb. It's a big improvement on what we had before. We used to have an Elga that sat on the wall. But when it ran out we'd need to order another and have to wait till it arrived. and it was expensive - about £100 every 6 months. So we looked at alternatives and found this one which is much better value. What we also like is the screen readout of the water quality so we know the expensive autoclaves are being looked after. Very good product. We've had it for almost 4 years now. We set it up as an extra tap in the kitchen - which comes with the kit. We take the filtered water from that to fill the autoclave every couple of days. We also use it for our drinking water and it tastes great. No need for the staff to buy mineral water anymore! We used to use Ionised bottled water but it was fiddly. We used to have to order it in and have a lot of bottles lying around. They got in the way and were heavy to lift. We also use it for the water going to the drills but add some altron for that. It's simple and highly cost effective compared to other options. We used to have a large distilled water machine which cost a fortune. We got this reverse osmosis filter when we moved into the new practice. We use it for the autoclaves and are very happy with it. There's no more waiting around for the distilled water. Now it's on tap whenever we need it so it saves us a lot of time. It works very well. Plus the replacement filters are very easy to fit. We used to use a smaller water purifier but it was clogging up our autoclaves. This RO was recommended to us. It's useful and works fine. In fact it's much quicker than the old purifier which we had to wait around to fill up. This system is instant. We did have an issue with a tap but the company sent out another promptly for free.